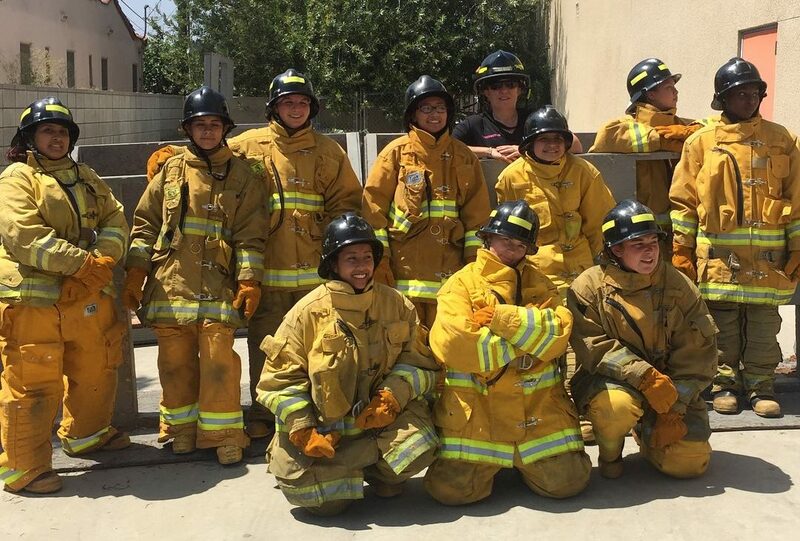 Last weekend the Los Angeles Fire Department hosted its third Girls Camp in hopes of inspiring teen girls to pursue a career with the LAFD. I am grateful to have had the opportunity to participate in the intensive and learn about a day in the life of a firefighter. Thanks to Civic Youth Leadership Academy, I was informed of this event from guest speaker LAFD Commissioner Rebecca Ninburg. I immediately signed up and was very curious to learn that only 3% of women (100/4,000) are in the LAFD. So this particular program is a vital resource for teen girls from the L.A. area. Over the weekend, we all dove deep into the various tasks firefighters need to know, such as CPR, climbing an aerial ladder, breaking down a door using forced entry as well as going through an obstacle course blindfolded, covered head to toe in firefighting gear: that’s not even the half of it! The skills we gained in such a short time went beyond just the basics to firefighting. On day one we formed teams and stuck together wherever we went; we got to know one another and share this new and exciting experience together. Collaboration and communication is what my team “The Dalmatians” achieved. We were surrounded with positivity and encouragement from the female firefighter mentors. The LAFD has a very low outcome of females in the department. This is unacceptable. Luckily change is happening right now and more women are becoming firefighters as well as girls getting interested at a young age. When I first attended the LAFD Girls Camp I wasn’t fully interested in becoming an actual firefighter but now I am inspired more than ever to become one and serve back my community! The mission of the LAFD Girls Camp is to challenge and empower girls by teaching them the skills it takes to be a hard-working firefighter.